The crew picked the season’s first cucumbers about a week ago. The tender young fruits were small and had a few bug-bites scabs, but they tasted of pure summer. This year, we’re growing ‘Socrates‘ because our favorite ‘Sweet Slice’ was unavailable due to a seed shortage. So far, they’re doing well, and we think they’re pretty good. All our cucumbers are grown in greenhouses. You can read/see more about our trellising system here. Throughout the summer, the crew will harvest cucumbers about five times per week. It’s pretty amazing to see the size difference in one fruit after 24 hours of growth during the warm weather. This week, the crew is also starting to harvest the first zucchinis grown in a greenhouse, and they will cut summer squash about five times per week for the rest of the season. Often times, the first zucchini on every plant will be stunted and somewhat misshapen. These fruits must be cut off to encourage the plant to keep producing. The ugly ones are sent to the farmstand kitchen, or they’re taken home and enjoyed by staff. The zucchini harvest can, at times, be a real hunt. When plants are young, the fruits are usually easy to spot, but as the foliage grows more robust, the green zucchinis can be a challenge to spot. The first zucchinis will make their way to farmers’ markets this week and weekend. These plants have been helped along by the extra warmth and protection of both the greenhouse plastic and plastic mulch laid on the ground. True zucchini and summer squash season won’t start for another month or six weeks when our outside plants begin to bear. By scheduling successive zucchini (as well as other summer squash) plantings both inside greenhouses and out in the fields, we should have a continuous supply throughout the summer and into the fall. It’s rhubarb season in Western Oregon, and the rhubarb patches at Gathering Together Farm are robust this year. The crew started harvesting stalks (technically petioles) almost a month ago, and the warm wet weather has been perfect for rhubarb regrowth. We will likely have rhubarb at our farmers’ markets and at the farm stand for another month or so until the weather starts to get truly hot and dry. While rhubarb isn’t technically a fruit, it does make a nice fruit-like addition to an Oregon spring diet because it comes on earlier than true fruits like strawberries. It seems that in the past few years, rhubarb has surged in popularity, but there is still quite a bit of misinformation circulating in the public lore about this ancient but still relatively unknown plant. Quite possibly the most common misconception about rhubarb has to do with the color. Rhubarb doesn’t “turn” red. It starts red and stays red unless it’s green (or greenish red) rhubarb in which case it starts green and stays green (or greenish red). Rhubarb is more like zucchini in that it can never be unripe; it just gets bigger until it gets overripe and starts to turn brown and woody. At Gathering Together Farm, we grow mostly red rhubarb because that’s what people want even though there is essentially no difference between red and green varieties (except that sometimes the green stuff is sold at a lower price). Our original rhubarb patch was planted almost two decades ago, and rhubarb has become a mainstay for our farmers’ market booths in the spring. Rhubarb is relatively easy to grow. It produces best when fertilized annually with composted manure and/or leaf mulch. We don’t usually water our patches because they produce most heavily during the rainy spring. The plants will continue to bear throughout the summer if they get enough water, but they will go dormant in really hot weather. Rhubarb is generally grown from starts not seed, and we’ve heard from farming friends that good rhubarb starts are hard to find. Ideally, rhubarb should be dug up and divided every 3-5 years, so it doesn’t get overcrowded. Each time we’ve done this, we’ve planted the extra divisions in a new area, thus increasing our rhubarb acreage and yield. When we divide our own rhubarb starts this fall, we may have extras to sell, so if you’re interested in growing your own rhubarb, check back with us later. For more info on growing rhubarb, read this article (though obviously herbicides are not part of our growing protocol) from the Rhubarb Compendium. The crew picks the most developed stalks of rhubarb from a patch every two weeks or so at this time of year, rotating the harvest area from week to week, which allows patches to regenerate between pickings. Crew members (Carmelo above) harvest rhubarb by simply giving individual stalks a good yank, which will cleanly free them from the root masses. A few crew members will do the pulling while others trim the stalks. A crew member (Cirilo above) uses a large, sharp knife to cleave off the large leaf and the papery flap by the base of the stalk. Rhubarb leaves are beautiful but mildly poisonous. The discarded leaves are left to mulch the rhubarb patch. Harvesting and cleaning rhubarb is not difficult or unpleasant. In fact, the crew can fill many tubs in a half hour or so. Tubs of rhubarb stalks are transported back to the packing shed to be rinsed, repacked, and distributed to our farmers’ markets, the farm stand, and restaurant orders. Though it can be used in savory dishes, rhubarb stalks are generally cooked into desserts or breakfast foods with generous sweeteners to counteract its inherently astringent flavor. For more info on how to cook and store rhubarb, along with its health benefits, check out this article on Foodal.com. If you don’t feel like cooking/baking on your own, GTF pastry chef Ana Patty has various rhubarb pastries and desserts (like the unbaked brown butter-rhubarb tarts above) on the menu in the farm stand on a regular basis. Kale and collards have always been and will always be staples at Gathering Together Farm. 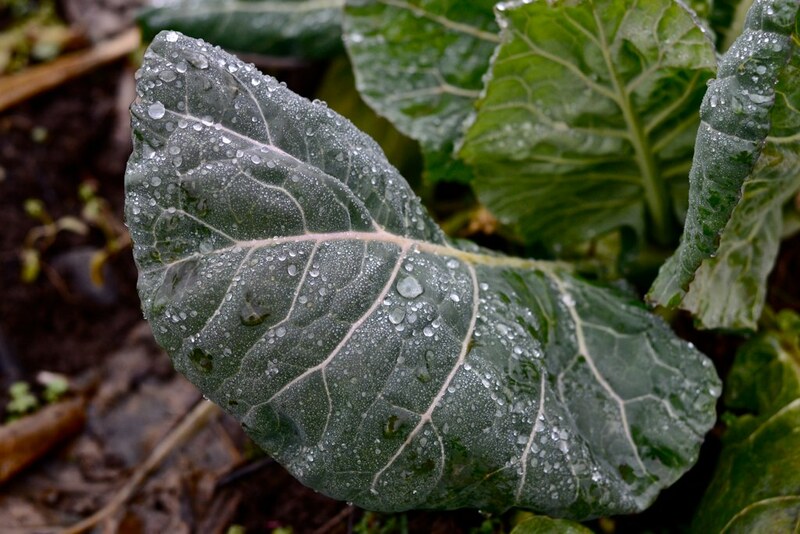 Oregon’s frosty nights and wet climate produce sweet and tender greens when other more glamorous vegetables aren’t available. GTF grows ten varieties of kale and collards on two to three acres of ground annually, and the extended harvest is sold at farmers’ markets, to our restaurant and grocery store clients, and through our wholesale distributer. Having a diverse variety list of kales and collards (as wells as most vegetables grown on the farm) allows GTF to offer distinctive tastes and looks to our customers. Often times, different varieties of the same crop will have slightly staggered maturity schedules, allowing for a longer and fuller harvest season. Additionally, if for some reason seed of one variety or another isn’t available for a year or is discontinued altogether, Joelene (GTF’s seed, greenhouse, and irrigation manager) won’t have to scramble to fill in with an unknown variety or seed source. 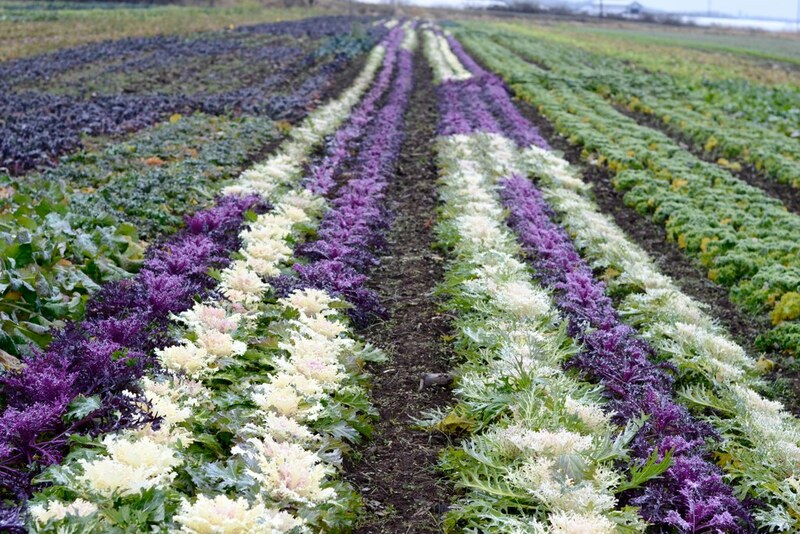 A good majority of GTF’s kale and collard seed is produced on-farm by our partners at Wild Garden Seed, but we also buy seed from Johnny’s Selected Seed and Osborne Seed Company. 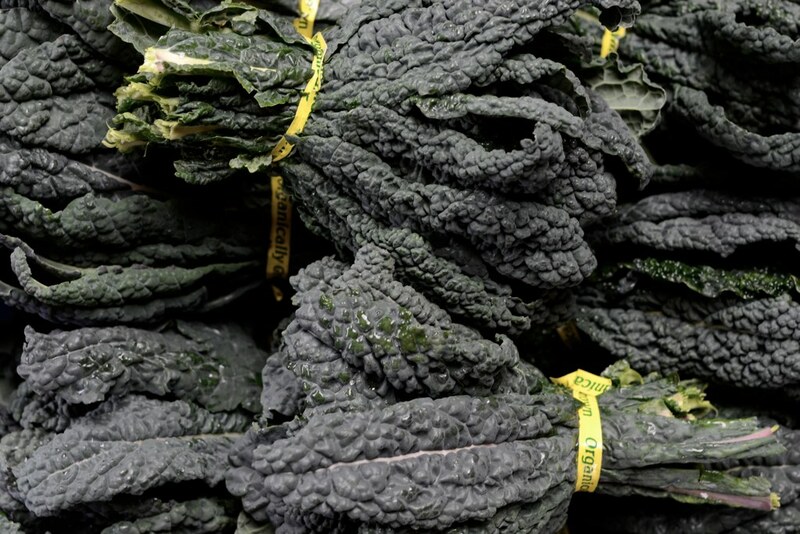 Lacinato kale (aka black kale, Tuscan kale, or dinosaur kale) is exceptionally flavorful and is the most sought after by our restaurant clients. Unfortunately, it is one of the lower-yielding varieties that we grow. 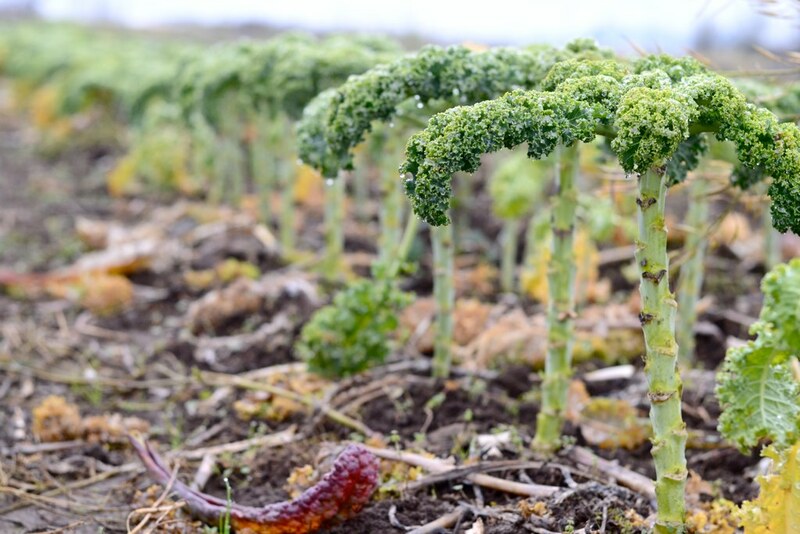 It takes the longest growing period of the kales to reach maturity, and overwintered lacinato is the first variety to bolt in the spring, producing a nice raab and then dying off early. 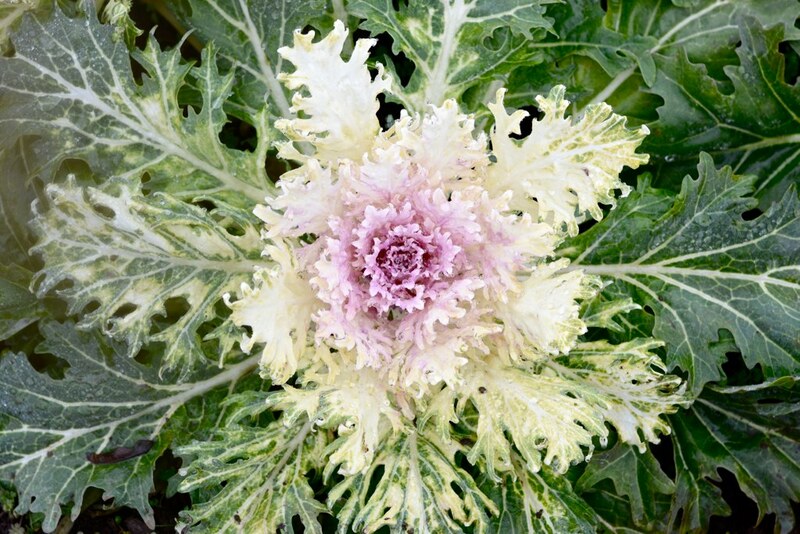 White Russian kale is arguably the sweetest flavored kale that we grow. 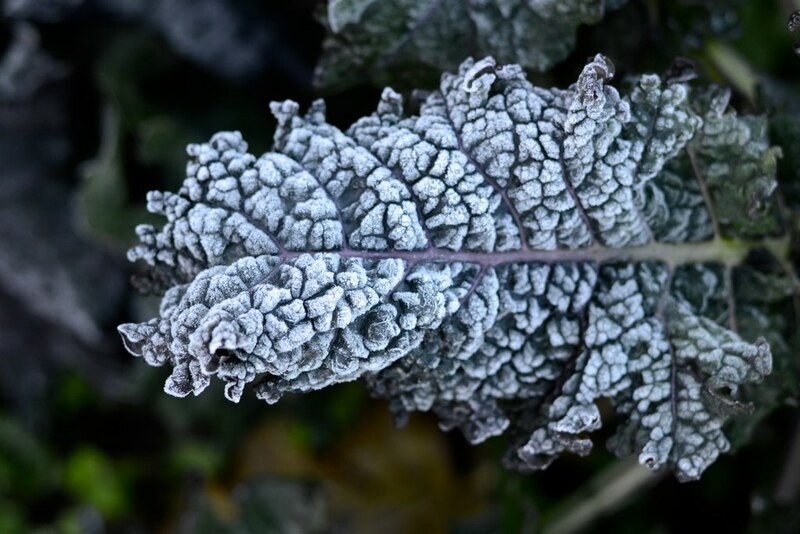 It’s also the most vigorous and cold hardy of our kale varieties, and overwintered white Russian kale produces an abundant spring flush of new growth. Both seasoned and novice gardeners would be well-served by growing this variety. Much like white Russian, this red Russian-type kale is delicious and produces heavily in the spring. Red Ursa kale is very showy and attractive with its signature frills. 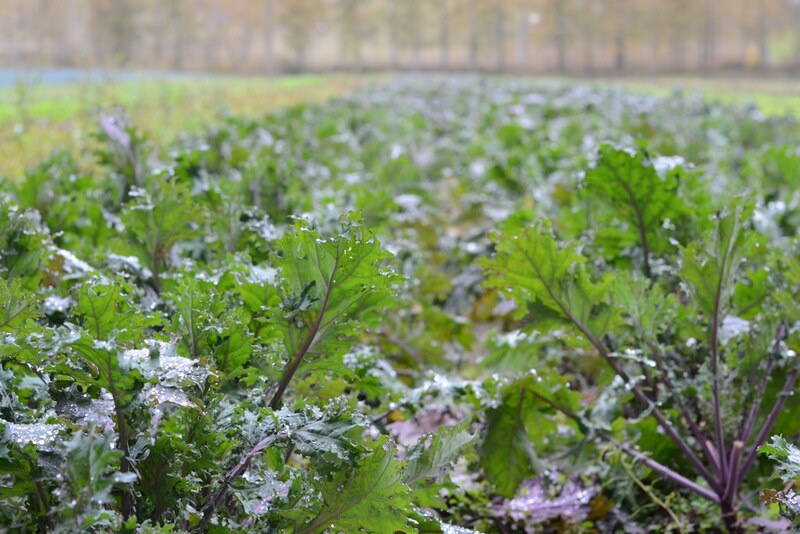 It is the last of the kale varieties to bolt in the spring, producing the last raab. Winterbor kale is a favorite among the field crew because the leaves are so ruffled and dense that only a few of them make an entire bunch. Confusingly, flowering kales are so named because of their ornamental leaves not because of any exceptional flowers. Gathering Together Farm grows flowering kale types only in the fall because the varieties won’t transform into the vibrant shades of pink unless they’re chilled at night. Peacock kale varieties are sold in bunches at the farmers’ markets and to restaurants, but much of it is cut at a young stage for salad mix. For fall/winter-harvested kale and collards, Joelene seeds one planting in the greenhouse in late June that gets transplanted out about three weeks later. She seeds a second planting in the greenhouse in mid July that also gets transplanted out about three weeks later. She also direct seeds a third planting the first week in August. (Jolene recommends that home gardeners direct seed fall kale and collards in mid-July or the very beginning of August.) Johnny’s Selected Seeds advises spacing plants every 8″ in rows 18″-30″ apart. 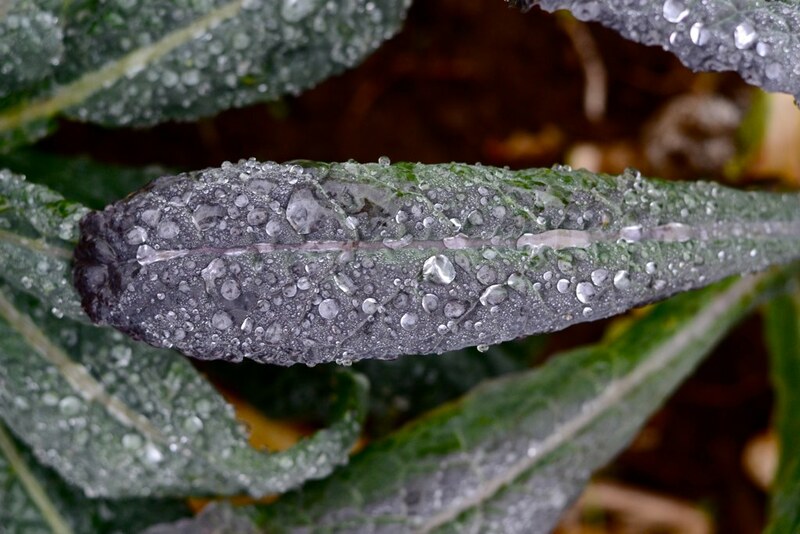 The field crew begins harvesting kale (and collards) in mid-September, but the greens don’t reach their peak of flavor until they get consistent nighttime frosts. 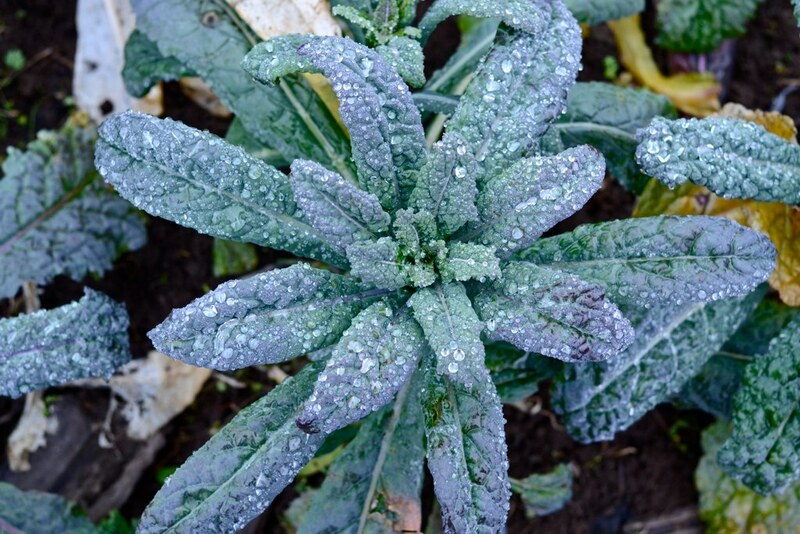 The plants will go dormant because of lack of light and heat in December and January, but the fall kale that doesn’t die off due to extreme cold will begin growing again in February. 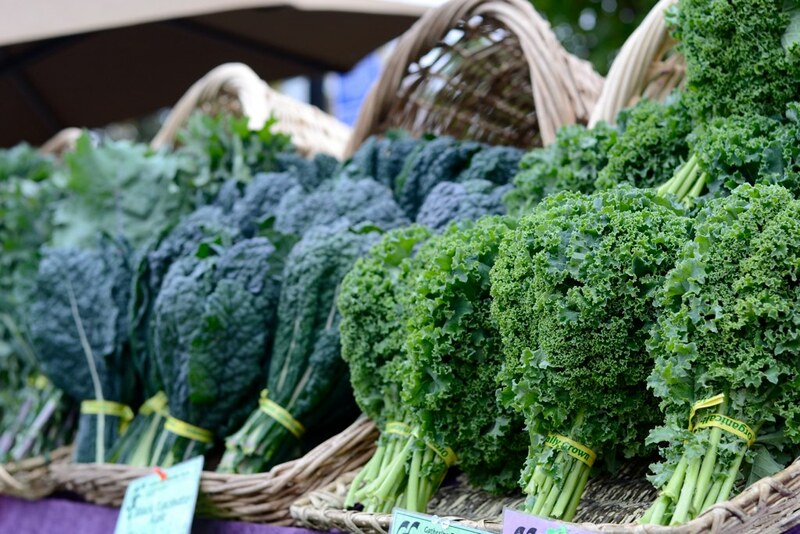 Depending on the variety, kales will begin to bolt in March or April, producing edible kale raabs (the bolting stems and buds on any plant in the brassica family–kale, turnips, broccoli, etc.). Joelene seeds another batch of spring kale and collards in the greenhouse in late February that gets planted out three or four weeks later. The tender transplants spend the first few weeks outside growing under floating row cover. 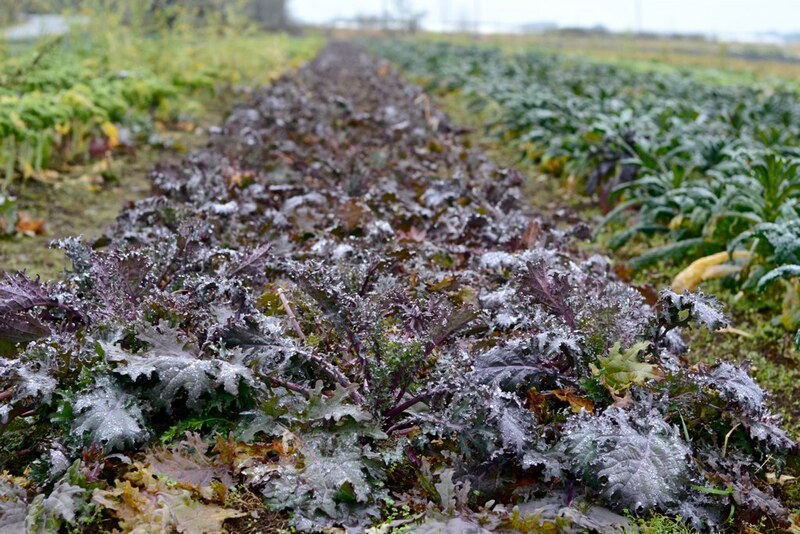 Around the time that the overwintered kales and kale raabs are winding down (early May), the field crew begins harvesting the new crop of spring kale. 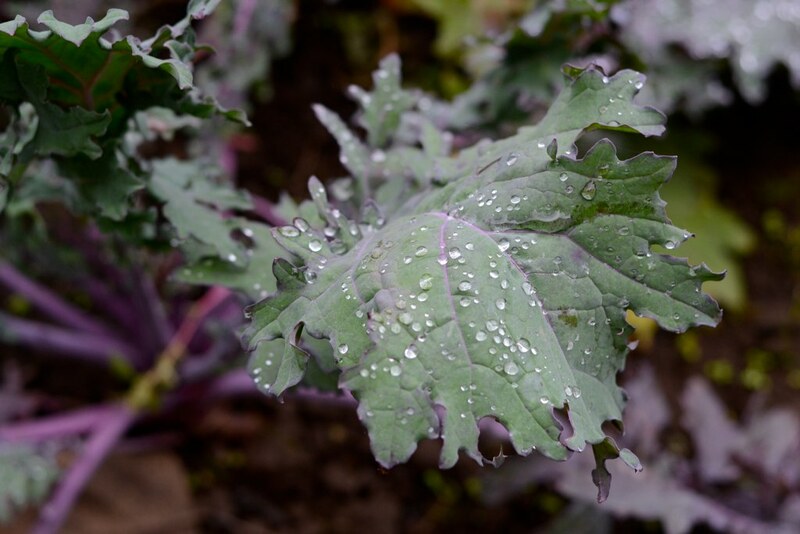 Though it will keep growing over the summer, its taste intensifies as its sugar content decreases with the warm weather, so spring kale is usually abandoned and eventually tilled under in late June or early July.